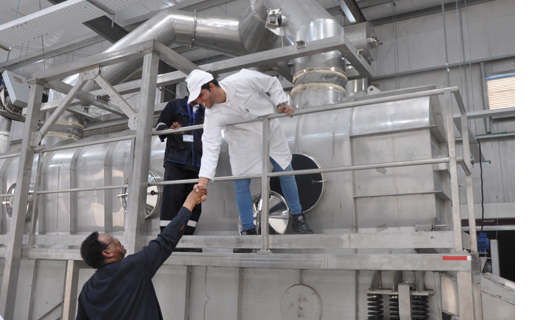 Sudan’s first salt iodization plant marks a milestone toward eliminating iodine deficiency. 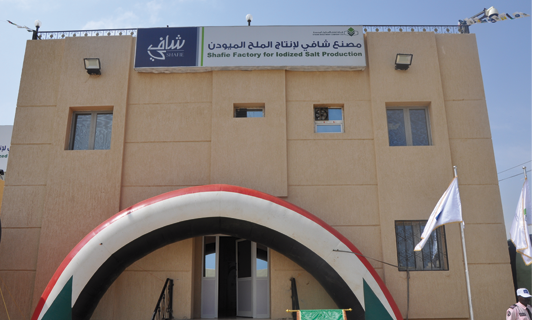 On February 7th, Sudan opened its first of three new salt iodization plants at the Shafie Factory, in Port-Sudan, Red Sea Province. 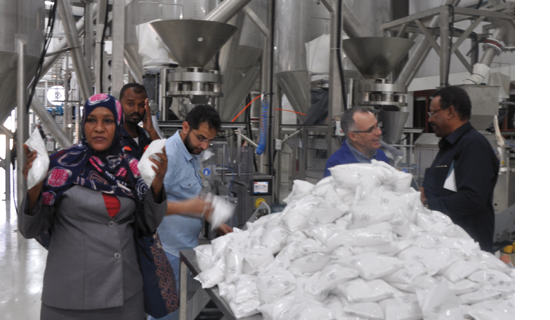 Inaugurated by President Omar al-Bashir, the plant is a major achievement for Sudan, which is one of the few remaining countries in the world classified with iodine deficiency. The Iodine Global Network has worked closely with the Government of Sudan, the World Food Program, World Health Organization, and UNICEF over the past few years to determine the technical requirements of the upgrade, and help the Sudanese salt industry purchase modern salt iodization equipment from Spain and China. These efforts and a close collaboration among all partners will expand the industry's capacity to supply enough adequately iodized salt to reach more than 20 million people. The IGN’s efforts were led by Dr. Izzeldin Hussein, Regional Coordinator for the Middle East and North Africa, and were made possible through the generous support from GiveWell and The Life You Can Save . The first plant in Shafie is a major milestone, which will have a profound impact on the health and well-being of Sudan’s population. Iodine deficiency has long been a major public health problem in the country, according to the Nutrition Department of the Federal Ministry of Health of Sudan. Prior to installation of the new plant, only 9% of the population had access to adequately iodized salt, leaving the rest of the population vulnerable to iodine deficiency and its consequences, including irreversible brain damage and mental impairment among newborns. "Iodine deficiency is one of the most common health problems in the country." In 2015, Sudan committed to addressing this major public health concern and set the ambitious goal of providing adequately iodized salt to the entire population by 2019. The country established a National Committee for Salt Iodization (NCSI) to support this effort, and brought together all partners to strengthen the program. Previous attempts to iodize the country’s salt supply had been unsuccessful, largely due to lack of technology and political instability. 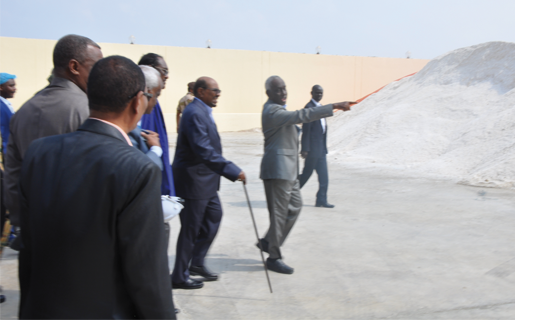 The President of Sudan tours the new salt plant. The Shafie Factory was the first of three new plants to be installed in Sudan and will have the highest total production capacity at 45,000 metric tons yearly. The two other plants planned for deployment are the Al Estjaba and Al Rasheed Salt Factories, each projected to have a capacity of 20,000 metric tons yearly, increasing the supply to 85,000 tons, and meeting more than 40% of the total demand for iodized salt. Above: IGN Regional Coordinator, Izzeldin Hussein at Shafie Factory on its inauguration day. Below: Izzeldin Hussein and colleagues inspect the first batch of iodized salt. The IGN and partners are looking ahead to support the salt industry and Sudanese Government to cover the remaining 60% gap in the supply of adequately iodized salt. As a next step, the IGN, WFP, and UNICEF will work with the Government to strengthen the regulatory monitoring system, and expand communications efforts to increase awareness about the threat of IDD and the benefits of iodized salt. The IGN with our partners is thrilled to be a part of this victory against iodine deficiency in Sudan. 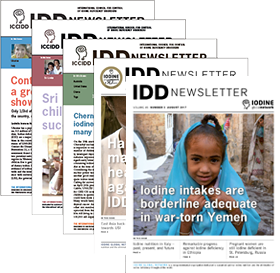 Subscribe to our IDD Newsletter for more updates on Sudan (coming soon). Subscribe to the email and print editions of the quarterly IDD Newsletter, and search our online library of past Newsletter issues.